2.5 Who were the Germans, and what did they want? Germans . . . or Austrians? 2.6 Why weren’t the Allies more helpful? Sarah De Nardi is a Research Associate in Cultural Geography at the University of Durham. Her focus on embodiment and identity frames war and conflict as lived experience in the everyday. She has published in cultural geography, anthropology, history and archaeology journals and volumes, and is Assistant Editor of the Journal of Community Archaeology and Heritage. Recently she co-edited Memory, Place and Identity: Commemoration and Remembrance of War and Conflict (Routledge, 2016). This book grows out of seven years of research in Italy, the UK and Germany, and is informed by a close personal connection to the topic of resistance due to the fact that her grandfather was a Partisan. 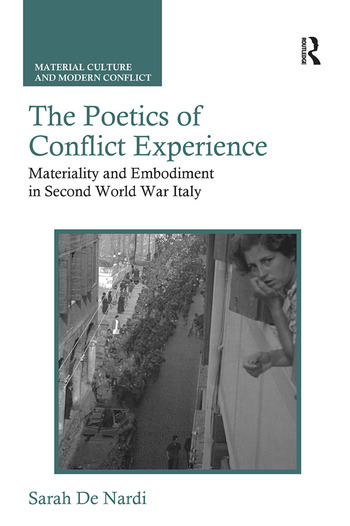 Her subjectivity as an Italian, European citizen and scholar is a recurrent theme in the book, lending a nuanced and engaging perspective to the overarching theme and the arguments put forth.